Before I came to Welcome Home Housing, I was homeless for ten years. After receiving a mental health diagnosis and finally receiving SSI, I was able to move to a room and board. To make a long story short, I felt unsafe at two of the room and boards and ran away. In one case, back to the street. At another room and board, the residents were not allowed to go into the main living areas of the house and we were confined to our rooms for basically 24 hours a day. When I heard from my social worker that there was this really unique and wonderful room and board with an opening, I decided to give it a chance. She said there was nothing else like it in Sacramento. It turned out to be a good decision, as I have been here now for about ten years. Some time ago, we had a kitchen remodel. 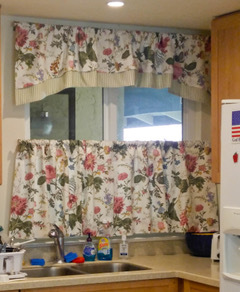 With the president of Welcome Home Housing's permission, I was allowed to provide some really beautiful cafe curtains for our kitchen. It was my way of contributing to a place that had finally become my home. I was able to get the material on sale at a closeout price and had them made up by a pattern designer at an amazingly low price. Every time I look at them, I'm reminded of what Welcome home Housing means to me. Another thing I really appreciate about living here is that, working within a budget, we are able to pick out reasonably priced foods from the grocery store of our own choice. This means a lot to me as, due to health problems, I have to be on a special diet. When I first came here, my cooking skills were very limited. Welcome Home Housing provided me with a cooking mentor until I could get on my feet. It wasn't long until I had the confidence to cook on my own. Now I have a wide variety of recipes to make that I can both eat for my health and really enjoy. Having staff available means having emotional support when I need it and brings a lot of stability to my life. I hope to be here for a long time to come. I have finally put down roots. I don't have to run anymore. I am home. NOTE FROM WELCOME HOME HOUSING: We are excited to announce that we are among the nearly 600 local area nonprofits participating in the fifth annual Big Day of Giving. On May 3, 2018, from midnight to midnight, our community will come together in the spirit of giving. We are grateful for our very generous supporters that helped us raise $5303 last year. Your gifts made it possible for us to expand our program by opening another house. Now six more people have a place that they can call home. We hope that you consider us as your first donation choice again this year and help us achieve our goal of $8,000. Click here to go to The Big Day of Giving and to make a contribution to Welcome Home Housing.